Who is this “Tebow” you speak of? Methinks this isn’t going to help the NCAA’s side of the O’Bannon case. Now I doubt they’re talking about running the wishbone because of the risk of subjecting Aaron Murray to an unnecessary pounding – although the thought of pulling that against Georgia Tech even for one play is amusing as hell – but there are still plenty of alternatives, from the Wildcat (note Richt said nothing there about leaving the QB in such a set) to some of the crazy stuff Dana Holgorsen’s known for that would be tantalizing. If nothing else, that just gave Clemson’s defensive coordinator something else to think about. In 2011, Slive — a man whose joy-evoking athletic talent has never inspired a single jersey purchase, let alone a lucrative television rights bidding war — reportedly received nearly $1.6 million in compensation from a conference that is considered a non-profit organization by the Internal Revenue Service. I only wish there’d been some way to fit a Michael Adams reference in there somewhere. If you’re jonesing for a heavy dose of sarcasm this morning, go no further. It happens to every successful coach at some point. Hell, it probably happened to Nick Saban when Alabama was only going 10-3 in 2010. You raise the bar for a given program higher than it has been for a while, but people get a little bit impatient when you fail to continue raising it. You could be a couple of 7-6 seasons away from full-fledged Glen Mason Territory. Back in my blogger infancy, i coined a term called Glen Mason Territory to describe when a coach achieves at a higher-than-normal level at a given school (probably a second-tier BCS program that hadn’t won in a while before he showed up) but cannot ever break through to the next level; he keeps making bowl games and winning, say, 6-8 games a year, but fans begin to get impatient. The crazies begin to start yelling things like “settling for mediocrity!” on talk radio and message boards, season ticket sales begin to fade, and even the rational fans in the base (the SB Nation readers, naturally) begin to start wondering if a change is needed. Now, Dan Mullen is not there yet, not by any stretch of the imagination. Well, that’s a relief. But it sure doesn’t sound like it would have been much of an upgrade, either. Just another be careful what you wish for reminder, folks. 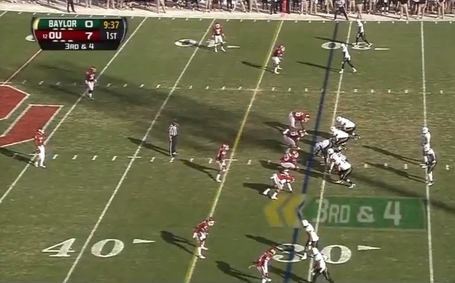 Here’s a neat look at what Art Briles’ offense is up to at Baylor. Now that’s what I call a spread formation. Comments Off on Nice system you got there. I’ve never been convinced an indoor facility is as big a deal as some make it out to be. Florida doesn’t have one either, and the Gators don’t seem to have been worse off for the experience. But I get why Richt and Murray would like one. It’s just that the topic has been beaten to death and nobody’s rushing to tap the precious… er, capital reserve funds. Not gonna happen. In related news, water is still wet.